When designing a home gym, many people focus their attention on the equipment. However, one fundamental area often overlooked is what you stand on – the flooring. The best flooring for a home gym provides the foundations towards any workout and it will become clear why. Therefore to help you hit the ground running, let’s check out what makes the best flooring for a home gym. Why Is the Right Flooring Important? I get a lot of people asking me, is a decent home gym floor really worth all the hassle? The answer is simple – yes. Home gym equipment isn’t exactly lightweight and it also costs a considerable amount of money to get kitted out too. A weight bench, treadmill, bikes – before you know it you have totted up a big wad of cash and the bulky tools to boot. By having the right flooring, you will preserve the life of the equipment and your floors. Think about it logically, if you keep dropping dumbbells, what’s going to give, the weight or the floor? The one thing you will notice about any commercial gym floor is the stable platform you have to workout on. This is down to the non slip or textured surface that gives you grip and improves traction. This prevents sliding around and potential risks of injury. Instead of worrying about losing your footing, you have confidence beneath you. This makes it’s easier to focus your attention on powering through workouts and increasing performance. 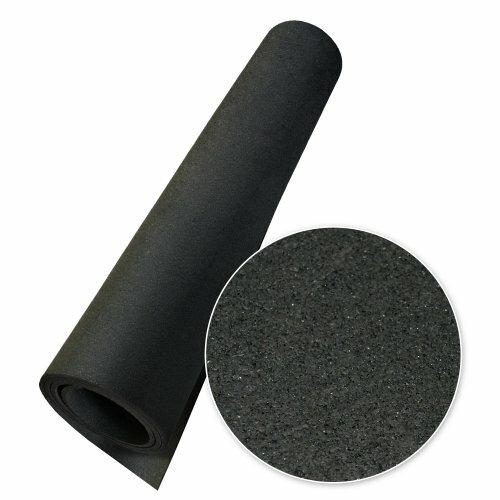 Having an extra layer of either foam or rubber on top of your floor surface will provide added cushioning support. Not only will help to absorb noise and keep neighbors complaints to a minimum, but more importantly it will alleviate stress and impact on your joints. Perhaps the designated room for your home gym was once a bedroom, a garage or even an office. Having the right flooring will make that room feel like a proper gym. Granted, this reason is simply down to aesthetics, but in my opinion it will give you that boost and drive to hit your workouts harder. If you feel like you are at the gym, it will put you in the right frame of mood and keep you motivated. With a home gym you need to accept the fact if your workouts are intense or your equipment has bulk it’s going to impact the ground it sits on. Rubber is hard wearing enough to be put through its paces. The durability aspect of rubber keeps it intact and reduces risk of splitting should accidents happen. However, one drawback with rubber is that it does have a higher price tag than the other main contender. Rubber flooring is available in many forms. You can find large rubber mats which are great if you don’t want a permanent surface. Alternatively if you are going the whole nine yards, rolls of rubber matting are available if you want complete wall-to-wall installation. Foam is popular because it’s an affordable flooring material. Foam is tough but not as sturdy as rubber therefore it’s geared towards lighter use. When put through abuse of heavy duty weights for example, it increases the risk of weakening or damaging the surface. However, where it does come into its own is for floor exercise. The extra cushioning provides good support and comfort for disciplines such as pilates, low impact aerobics and smaller hand weights or kettlebells. The most popular styles of foam flooring are the interlocking types. This kind fits together like a jigsaw puzzle and doesn’t need a master’s degree to work out how to install it which is a plus in my book. Now that I’ve briefed you on the whys and wherefores of gym flooring, your next step is to trawl through the endless options out there. However, to give you a head start I’ve done some groundwork for you and have come up with five top flooring options which I believe should be suitable for most home gyms. Rubber Cal has made their elephant bark floor mat with an eco-friendly approach to the home gym. Made from recycled rubber tires, the material is both impact resistant and has anti-slip qualities that provide great traction. 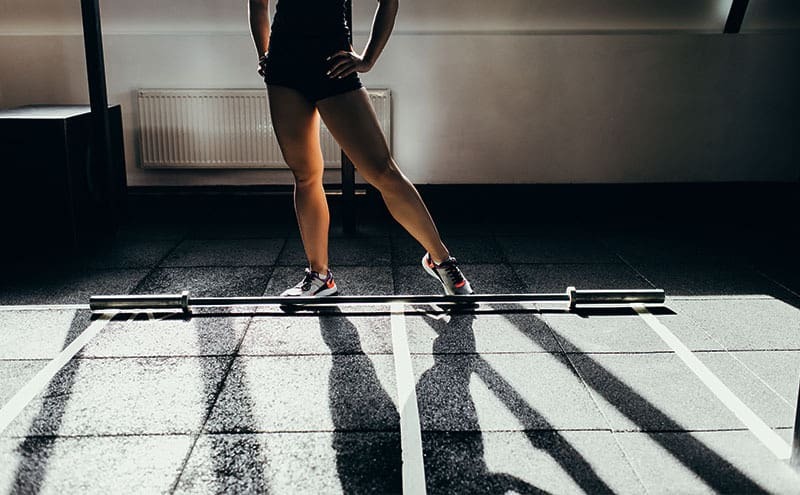 For me, these are both important considerations with any kind of home gym flooring. This floor mat is an expanse of 4 x 25 feet, allowing a substantial 100 square feet of gym space. However, it does come in a variety of sizes to accommodate most areas. With a name like elephant bark it implies a tough and durable surface. It’s also priced well therefore could be suitable for those looking to cover a larger than average floor area. Those using it for heavy equipment found it suitable. Even with the constant movement of weights, benches and other equipment over the floor there was no apparent sign of wear and tear. One drawback, the mat is very porous which meant any liquid spilt goes straight through and may prove problematic for some. 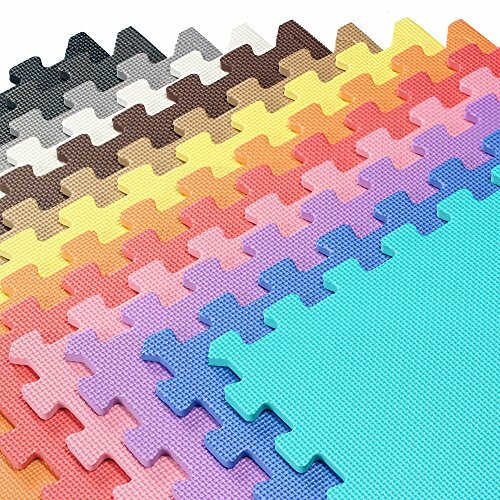 We Sell Mats offer square interlocking foam tiles and a colorful solution to any home gym. Each pack contains 12 tiles which covers a generous area of 48 square feet. They feature 10 different colors, so if black isn’t your first choice you can get creative. Each tile is ⅜ inch thick and made from EVA foam which is soft enough to lay down on for stretching or yoga yet resilient enough for aerobic activity. Many note it’s a great option for gym flooring if you are on a budget. However, some users found the tiles began to separate or buckle at the seams when moving around during high intensity exercises. Prosource interlocking tiles are geared for those looking to convert any space into a workout zone. One pack of six tiles provides an expanse of 24 square feet. The tiles are also ½ inch in thickness which should provide a great base for fitness equipment or a solid platform for a variety of workouts. The textured surface non skid surface allows for better grip and reduces risk of slipping. This should allow greater confidence to push to the max during your fitness routine. Many feel these tiles work well and hold up for plyometric routines and floor exercises can be performed with a good degree of comfort. Unfortunately others were disappointed with their choice. Some felt as soon as they did anything on the tiles they appeared to come apart and started shifting around. Square 36 have designed an extra large exercise mat which is geared to compliment a wide range of home gym workouts. 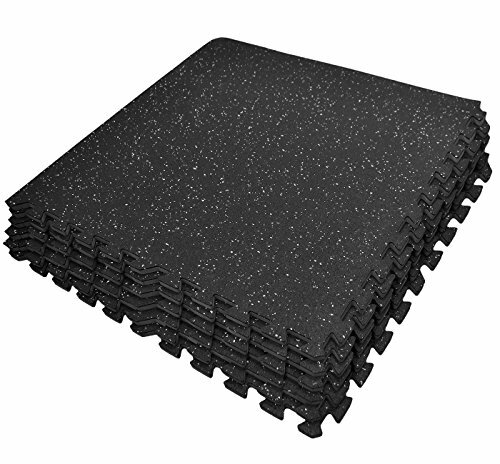 This mat is made from durable natural rubber with a high density foam underside that should be a great combination for withstanding vigorous activity. The material is great for cushioning and absorbing impact which makes it easier on the joints too. It’s also decent size of 8 x 6 feet, giving you 48 square feet to play with that allows either ample room for cardio workouts or your weight bench. 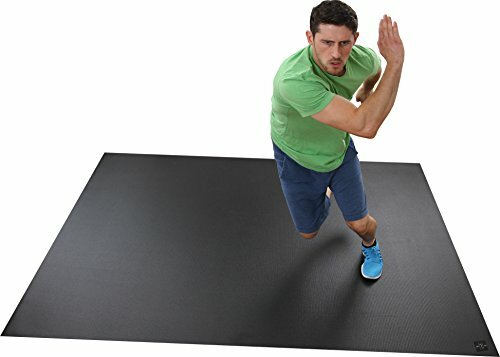 Overall, the majority note this is a durable mat that provides adequate padding, yet it’s not overly spongy therefore it doesn’t rob you of power during intense plyo moves. However if your intention is to get all hot and sweaty you may have issues. It seems the sweat droplets causes the smooth surface to become very slippery underfoot, which for some people interfered with their workout. Sivan Health and Fitness are offering interlocking gym tiles for that extra support on harder surfaces. The surface is of high density rubber, a durable material which should withstand stresses from the weight of heavy gym equipment. The bottom layer comprises of EVA foam that bolsters support for any type of floor exercise. As for what’s inside the box – you get six tiles per pack covering 24 square feet in total which should serve as a good starting point for a base. For some, the tiles weren’t what they expected for the price. The rubber layer was thinner than they anticipated which caused some users problems with it peeling away from the foam. My number #1 choice has got to be Rubber Cal’s elephant bark floor mat, for me it simply hits the sweet spot for home gym flooring requirements. It’s made from tough material that makes it a great all-rounder – whether it’s bulky gym equipment or pilates, this flooring should stand up to the test. 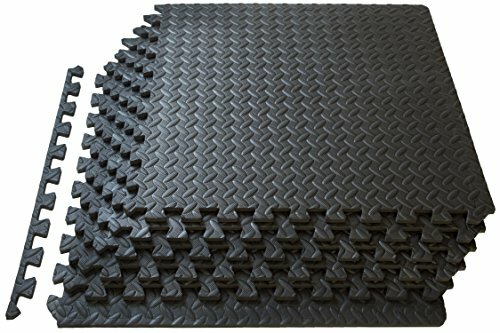 Therefore I believe this is the best flooring for anyone looking to set up a home gym. The 5 Best Bed Risers for Queen Bed in 2019? What is the Best Treadmill for Runners in 2019? What is the Best Treadmill for Home in 2019? What is the Best Preacher Curl Bench in 2019? What is the Best Home Bench Press in 2019? What is the Best Home Gym Reviews in 2019?